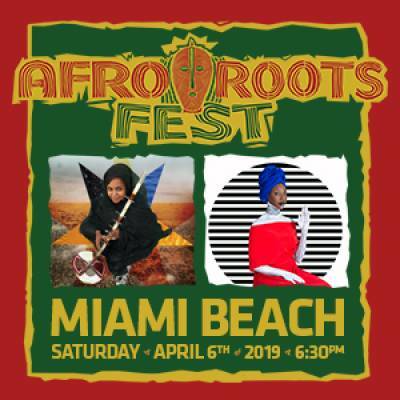 The April 6 Afro Roots Fest concert in Miami Beach will be all about the feminine spirit of world music, featuring a double bill of African chanteuses and a team of local dancers. Mauritanian Griot Noura Mint Seymali and Malian singer / guitarist Fatoumata Diawara will perform at the North Beach Bandshell (7275 Collins Avenue, Miami Beach, FL 33141), as will the African Watoto Dance Theatre. This is the first official concert of the Afro Roots Fest’s 21st season; doors open at 6:30 p.m.
Pre-sale tickets are now available for $28 online through bit.ly/ARFMB19, and will be $35 at the door; all ages are welcome. Co-presented by MDC Live Arts and the Rhythm Foundation. More information: http://www.AfroRootsFest.com or call 305.672.5202.